Wonderful yellow roses bring unusual spirit of tenderness and touch the deepest strings of her soul! 7 yellow roses with mostera and greenery in a nice wrapping. 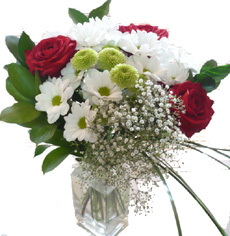 Tender, fresh, long-stem white roses to show your care, attention and sweet feelings! Five roses - small;seven roses - medium; A dozen roses large arrangement! 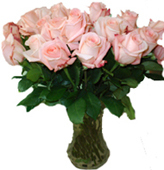 Long-stem, fresh-cut, soft pink roses for tender and caring relationships! Five roses - small; seven roses - medium; A dozen roses large arrangement! A tender flowers arrangement with 5 pink roses, white chysanthemums, ghypsophillas, dry flowers with greenery and nice wrapping. Yellow fresh roses for special occasions! Five roses - small; seven roses - medium; A dozen roses large arrangement! 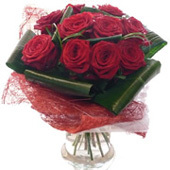 Velvety dark red roses will show the full deep strength of your feelings! 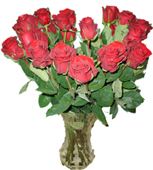 Five roses - small; seven roses - medium; A dozen roses large arrangement! 5 Bright yellow roses and 4 violet irises with greenery make this arrangement unforgettable. Your choice is exclusive and brave! 4 yellow roses, 5 lilac chrysanthemum with greenery. A bright mix of flowers makes each day special.